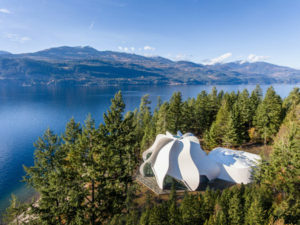 Designed by Patkau Architects, the Temple of Light in Kootenay Bay, B.C., has won the 2019 Wood Innovation Award. Calling it an “experience out of wood”, the jury noted the project’s complex, curvilinear geometry, and the diversity and flexibility of using wood. Now in its 15th year, the wood design awards recognize innovation and leadership in advancing wood use in design and building, while honouring structural and architectural achievement using wood. There were 103 nominations in 14 categories from many locations in British Columbia as well as the United States and Asia.